The Hispanic Center of Western Michigan has been providing social services to the Hispanic community for over 40 years. With a mission to educate, advocate and empower Latinos, the Center has unfortunately gone without leadership for more than a year. However, last month a new Executive Director, Adnoris “Bo” Torres, was hired to continue and expand the organization’s work. 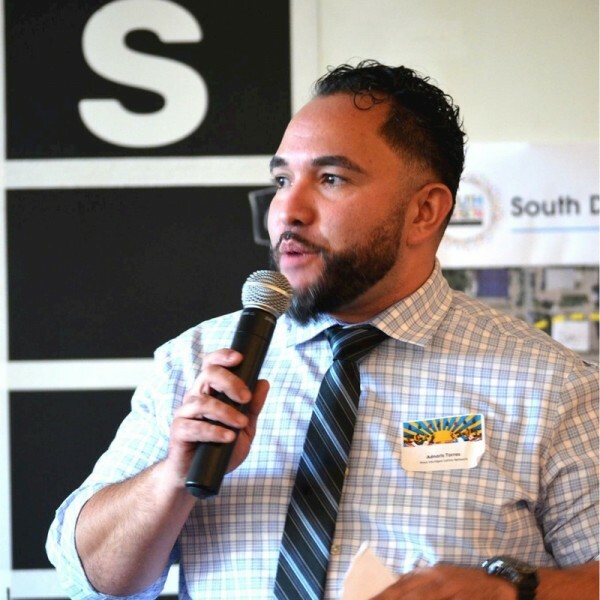 We sat down with Bo to learn about what attracted him to the Center, his background, thoughts on intersectionality in the Latino community and what’s next for the Hispanic Center. UCC: Congratulations again on joining the Hispanic Center as the new Executive Director! What made you want to be part of this organization? Bo: I've worked in this community for the last two years and developed a really keen sense of what's going on and what’s needed. I collaborated with different organizations like the Latino Community Coalition, the Latino Network and the Latina Network. We knew there were people [at the Hispanic Center] that were doing great things, but nobody could vocalize what exactly they were doing. I was really encouraged by people who knew the work I was doing with fathers in community to apply. I don’t think anything happens without there being a reason for it to happen. I'm excited to make sure our work speaks to the needs of the community. UCC: What were some of the great things happening at the center? Bo: The work that was happening in their classes was amazing - like the SOL [Supporting Our Leaders] program for youth, language services, work with domestic violence sufferers and survivors, undocumented persons and others. They were working towards something special and had a vision, but just didn’t have anybody to help drive that vision fully forward. UCC: You’re a former educator. How does that experience influence your goals at the Center? Bo: I’ve been fortunate enough to work in education at different places. Whether it be in after school programming, inside schools, or working with fathers and the unborn babies of the community, I’ve been able to closely look at what our needs are in education. Being able to see and meet those needs at the Center is something that I really look forward to doing. UCC: Do you plan to lead from a place that centers the importance of education? Bo: Yes. Starting with early literacy rates to third grade literacy tests and beyond, I hope to have programming at the Center that’s going to speak to all those different needs. But I don’t just want to speak to them, I want to enact things that are going to be powerful. I want mentorship to happen here, developmental support for mothers and fathers, and more — a wrap around birth to retirement strategy for educating our community. Education in things like health, upward mobility and home purchasing also matter. For example, we have a partnership with ICCF starting soon that’s going to educate persons in the community as to what they really need to own a home so that they can build equity. Those are some of the things that I really want, but it all goes back to early exposure to literacy, educational opportunities at 1 or 2 years old and making sure that babies understand that education is the key to their success. UCC: Wrap around services from birth to retirement. Is that a strategy the Center has taken before or would it be a new direction? Bo: I think it’s been done, but it hasn’t been viewed in that manner. I don’t think we started our vision thinking of the baby in utero and how we can effect that life all the way through their maturation. There have been programs for youth and programs for adults but they haven’t really intersected. I have a vision of having our programs and services woven in a way that's going to successfully effect that one person throughout their whole life. UCC: How will you support the Latinx community at the center? Bo: The first thing is to understand what that term actually means. We’re going to do education internally with staff to understand what a Latinx person is and what they represent. After we’ve had that professional development, we’ll use that knowledge to go outside and engage people in an intentional manner. That way, when we’re looking at someone and their pronoun is ‘they’ we know what that means for them. We’ll also build that mindset into serving youth that may need someone to understand and listen to their needs when it comes to identity and gender. UCC: You talked about identity as it relates to gender. Let’s talk about racial identity in the Latino community. Is that something the Center is concerned with? Bo: Absolutely. The problems are a combination of gender politics and identity, colorism within our community and ageism. We can’t just look at what news channels portray as the model Latino. We have to understand that there’s a deeper, richer cultural identity that encompasses the Afro Latino community and that includes elders but also listens to the new generation. It might be idealistic, but I think that if we shoot high enough, try make these intersections visible and have a lot of conversations about what they mean then we’ll have a rich understanding of our community as whole. The [Latino] affinity groups and community organizations that exist today are doing a lot of work that is very powerful. We have to understand all our different experiences to be an organization that represents the full Hispanic community. UCC: You've said clearly that it is the Hispanic Center of Western Michigan. Why is that important for you to emphasize? Bo: As an anecdote, we had two young women come in from Saugatuck, MI. They made the drive because they didn’t feel supported in their community and wanted access to education, programs and culture. Our name lends itself to having a power that’s not just Grand Rapids. We’ll make sure that we are reaching out and bringing people together. I think this is one of the things that the Hispanic Center should be doing. Advocate, educate and empower — our mission is not just for the people of Grandville Avenue but of Western Michigan as a whole. UCC: It’s January 2024 and we’re talking again. What has the Hispanic Center accomplished in the last five years? Bo: We’ve built pathways for higher education; lowered the infant mortality rate for West Michigan (the infant mortality rate for the Latino community is the highest in the nation here in Michigan); developed programs, initiatives and community engagement that can be used for models for the rest of the country; developed progressive regional partnerships and advocated nationally; researched how the interaction between the elderly and youth can lead to gains in transfer of historical knowledge; and uplifted the voice of the younger generation, having them engaged and trust that their Latino-ness is not just their language, dress and the music they listen to. That’s what I think we can do in five years. UCC: What do you think other cities can learn from Grand Rapids? Bo: I think Grand Rapids has a great culture of learning, speaking to issues that are national and using our density and connections to affect what’s happening. As a community we’re also looking at models and ways to combat our social ills. I truly believe that because we have conversations that are hard to have, but are necessary we can lead by example and be at the forefront of exchange of information and communication. Other communities should also look to develop groups like [Urban Core Collective] that bring together cross cultural and generational experiences. We can teach others, but we can also learn from other cities and organizations that work with the Latino population. It’s really about learning, teaching and engaging in a way that’s going to be fruitful for generations to come after we’re long gone. UCC: What else do you want people to know about what’s next for the Hispanic Center? Bo: We just want to be a voice that is amplifying all of the other voices in the community — and the city, county and across West Michigan. Any issue that the community thinks we need to take on we want to hear from them. This year is about listening to what we’ve doing wrong, what we’ve done right and how we can engage everyone in the community. We have an open door policy. The doors are always open for you. Come speak with us. Come vent. Come engage and be a part of solutions to problems that you haven't seen addressed.